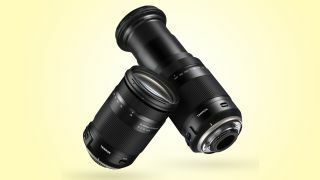 Tamron has unveiled what it's calling "the world's first ultra-telephoto all-in-one zoom lens" for APS-C Canon and Nikon DSLRs, offering photographers a massive zoom range for maximum versatility without the need to change lenses. Taking into account the 1.5x crop factor imposed by Nikon APS-C bodies, the 18-400mm F/3.5-6.3 Di II VC HLD boasts a remarkable effective focal range of 27-600mm in 35mm terms, while on Canon DSLRs that's extended even further to 29-640mm, thanks to the slightly higher 1.6x crop factor. Ultra-zoom or all-in-one lenses are popular with hobbyist photographers looking for a single lens that can – literally – cover all the angles, and are suitable for everything from holiday snaps and landscapes to wildlife and sports photography, and even macro shooting. Tamron has been pushing the boundaries with its superzoom lenses over the years, stretching the reach of its all-in-ones to 300mm – and now beyond – at the telephoto end. The closest Nikon gets to the range of the new Tamron is with its AF-S 18-300mm optics, the f/3.5-5.6 ED VR and f/3.5-6.3 G ED VR, while Canon doesn't even come close, maxing out for APS-C-compatible lenses with the EF-S 18-200mm f/3.5-5.6 IS. Third-party rival Sigma, meanwhile, also tops out at 18-300mm. The 18-400mm f/3.5-6.3 delivers its unrivalled zoom range in a relatively compact and lightweight design, making it ideal for travel and street photography. The Nikon model is 121.4mm long and weighs 705g, while the Canon version is slightly longer and heavier at 123.9mm and 710g. The lens comes with Tamron's Vibration Compensation technology to combat shake when shooting handheld, while the autofocus system uses the brand's HLD motor for what's claimed to be accurate and quiet focusing. Cramming so much into a relatively light and compact lens typically involves compromises in terms of image quality compared to that from prime lenses or optics with more modest zoom ranges – we anticipate that being the case here, but we'll have to wait to see how the new Tamron performs.